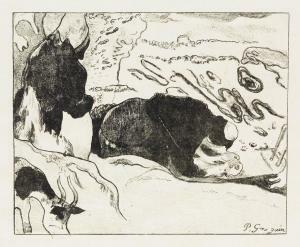 Find artworks, auction results, sale prices and pictures of Paul Rene Gauguin at auctions worldwide. Woodcut on thin Japan paper, mounted on light tan card-stock so the signature does not appear in reverse, as issued, 1898-99. 235x220 mm; 9 1/4x8 5/8 inches, full margins. 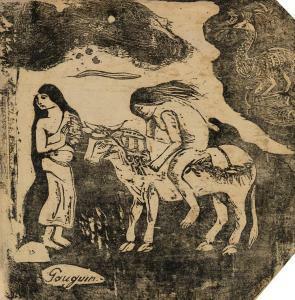 From the first edition of approximately 30 impressions (before the posthumous edition published by the artist's son, Pola Gauguin, and Leicester Galleries, London). Numbered "28" in ink, lower left recto). 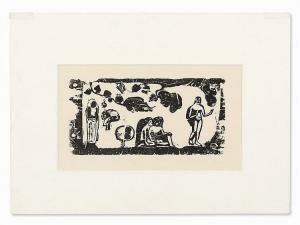 A superb impression of this extremely scarce woodcut.